She Writes Press, 9781938314001, 228pp. What's Your Book? 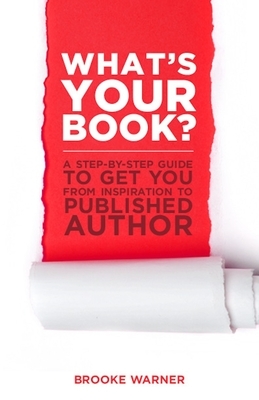 is an aspiring author's go-to guide for getting from idea to publication. Brooke Warner is a publishing expert with thirteen years' experience as an acquiring editor for major trade houses. In her book, she brings her unique understanding of book publishing (from the vantage point of coach, editor, and publisher) to each of the book's five chapters, which include understanding the art of becoming an author, getting over common hurdles, challenging counterproductive mindsets, building an author platform, and ultimately getting published. Brooke is known for her straightforward delivery, honest assessments, and compassionate touch with authors. What's Your Book? contains the inspiration and information every writer needs to publish their first or next book. Brooke Warner is founder of Warner Coaching Inc., publisher of She Writes Press, and author of "What's Your Book? A Step-by-Step Guide to Get You from Inspiration to Published Author." In her thirteen years in the publishing industry, Brooke shepherded over 500 books through the publication process. Her expertise is in traditional and new publishing, and she is an equal advocate for publishing with a traditional house and self-publishing. Find her online at www.warnercoaching.com and www.shewritespress.com.